I’ve shown something similar before – a little faux hand lettering using markers and a brush! I doodled my flowers but you can also stamp them with flowers from another set you already have. And be sure to check out the huge collection I created below of all the different script-stamp-sets that I think would be great with a technique like this! Watch the video below or click HERE to see it in HD on YouTube. 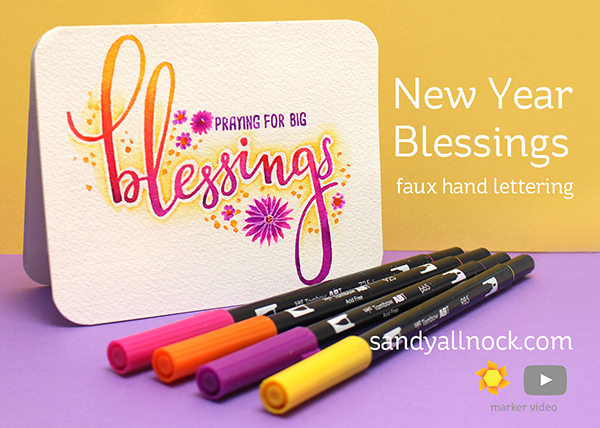 I chose “praying for big” by using 3 little stamps from the set together – lining them up in the MISTI. For those asking, I finally updated THIS page – with all the stuff I’ve used on Instagram lately, as well as a few sneak peeks of what’s coming soon. One resolution for 2017 is to try to update that way more often! Wow… I’m just amazed at this beautiful card! I’m humbled to watch your creative process, enjoying each & every detail. Thank you so much for sharing, & I too wish for a blessed year! Great video, beautiful card, awesome start to 2017, thank you! Wow!!! Looks so easy to do, but comes out amazing and I know I couldn’t pull it off. Great versatile technique! Way to think outside the box! I love that this can be done with so many different stamps. Fantastic! Thanks for the tips. This is just beautiful! I love the technique, and can’t wait to give it a try, and…I’m pretty sure I ‘need’ that stamp set! Thank you, Sandy! Wishing you all of God’s many blessings for this wonderful new year! Thanks for the video Sandy!! I’m amazed at how you keep discovering new techniques! Thanks for the great video, and wishing many Blessings for you this year.